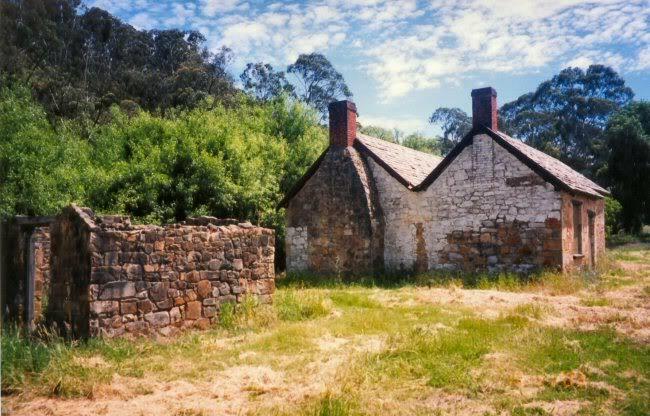 One of South Australia's oldest homes, the Heritage listed Mackereth Cottage, was built by my husband's (Bruce) ancestors in 1839, on the banks of Scott's Creek. The cottage has had extensive restorations over the decades, only to be again vandalised. yesterday the it was destroyed by a fire, after a stolen car was set alight next to it. I am saddened by some of society today. We have a similar problem over here with the youth stealing cars and setting light to them. The teenagers of today spend most of their time aggravating others and generally being complete idiots. Time for the big stick if you ask me. Nice pic Jan and, although a small consolation, you have a memory of it. I totally agree with you Stewart! and yes this was the first and only time I had the privelege of seeing it. We were lucky enough to have a look through it as well. A wonderful photo with a sad story to end. Thanks John, this photo was taken with my film camera (before my digi) it is a Pentax 928 all Auto. A brilliant camera. I have heard one of the best Pentax had made at the time. Very nice image...great colors and sky...and a nice memory. Maybe you could offer your image to the organization that maintained it for history's sake. It's hard to read the paper these days...there are some very sad and scary people out there. Thanks Terri, actually one of Bruce's cousins has many nice photos, it was Don who took us to see the cottage. He works closely with the Historical Society, so I am sure he will share the photos. he was actually very involved with setting up the maritime museum in the Port of Adelaide. Great image Jan of your husbands, heritage, Have you tried doing a conversion and aging the photo. Teenagers, can't live with them and can't beat them. No Robin I haven't, maybe I will try one day, It should look good in sepia. Thanks for suggesting it. Subject: Re: Mackereth Cottage - Destroyed!